I paused. With Drama. Is that a Caesura? Not a wincingly surgical procedure but a dramatic pause in the middle of a line? I feel sure I learned about caesuras way back when when the minutiae of classical dramatic theory really mattered. I will not deny that the pause, whilst dramatic, was also convenient. It gave me time to think. There was no easy way to say this. I had. Flying through my mind were the myriad reminders my son had administered over the previous fortnight; every now and then he would say, ‘Mum, don’t forget that I need a kazoo for music…’ and I would tell him to catch me with my laptop so that we could order something so exotic online. But perhaps, if you have an 11-year-old son, you might have spotted my mistake. For reminders are as far as they go. They do not bring resources together, broker deals, achieve results, forge forward in triumph. My son is an adorable,voluble bag of hot air, and we never got to the sitting down in front of the computer and ordering bit of the plan. Now, it transpired the kazoo was not just for a lesson. Oh, no: this kazoo was for a school concert, to be held this very night. Everyone, simply everyone, must have one. If they did not they would stand out. And we can’t have that, can we? Did I mention that a recurring nightmare of mine is arriving on stage in front of hundreds without a script? On the soloists stand for a concerto, without my score, or worse, without having practiced? And now my son was facing a kazoo concert without his kazoo. I was going hot and cold. I melded my mind back to the Tesco phone helper. Such a nice young man, and so industrious. I think he thought I was a Mystery Shopper, sent to test him. Ah, young man, when you are my ripe old age you will find out that the really outlandish facts – the strangest situations – nearly always turn out to be true. He found kazoos. 30 of them in one bag: and in their warehouse, not within 60 miles of our home. They might as well be a gazillion light years away on the Planet Kazoo. They are no use to me. I smiled ruefully and thanked the young man for his industry. The things parents have to do to make sure their children fit in. My search has been fruitless but in the mean time my son contracted a nasty little fever which means that he has had to have a day off school and will not be performing alongside his compatriots in the school concert. He is much better now though, and I feel sad that I will never see him in his school uniform smartly performing the kazoo concerto I have dreamt up in my fevered, over taxed imagination. I have no musical ability and these kazoo things seem very complicated to me. However, I am very accomplished at making a mean screech by blowing on a blade of grass held between my thumbs. Will that get me a spot in the reed section of the orchestra? I think someone should write a concerto for t immediately, Carl. Hey! *excitedly* I can do that too! D’you think we should form a duet? Do you fancy the bass grass or the treble? Actually I have been practicing sneezing to get into woodwinds section. 😀 I am very pleased to hear it, Patrick! 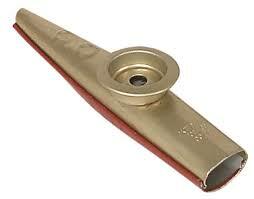 Oh too bad, someone gave me one just this month and I really do not want to play a kazoo! Oh, Andree, so near and yet so far! Thanks for coming along to read today and commenting. Hope Felix is on the mend from his kazoo flu soon. Oh, Nancy, I wish I had talked to you in the midst of my panic.Ho hum. Fevered – but, kazoo less. I do hope the fever has abated and not developed into an ahhhh – kazoo! Ha! It was begging to be said, Penny. Hope you and Andra had a lovely time this week. Felix creeping like a snail unwillingly to school this morning. Loved this, and Carl’s comment is so funny. Glad Felix is on the mend. This is hilarious. But you were daunted by a mere 120 miles? Better lay one on now, though, against the next time. Better get a didgeridoo, too, to be on the safe side. kazoo induced fever perhaps 😉 I only know the caesura as a poetic device (didn’t know it was also a dramatic term).